Just sitting here in my recliner doing some reading. Just to my left our fireplace is burning, popping and crackling. We are going to try to use it more this winter to try to keep the utilities down. Every half hour or so, I need to move some wood or add some wood to keep it burning nicely. It sort of inspired me tonight. Thought I would take a moment to encourage you to keep the fire going tonight in your life. Maybe you need some more oxygen...some more of the breath of God in your life to increase your flame and visibility for Him. I know I do. Maybe you need the fire to burn up some of the impurities in your life. I know I do. Maybe you need the fire to give light to your path and direction. 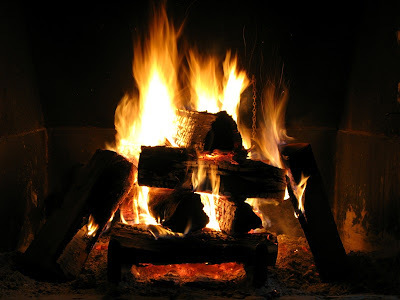 Maybe you need the fire to warm up some of the cold areas of your heart. Maybe you need the power of the Holy Spirit to come like fire as it did in the early church and revive your passion for God. I know I do! Just having a moment sitting next to the fire right now. Before heading to bed, I wanted to encourage you to keep the fire going!